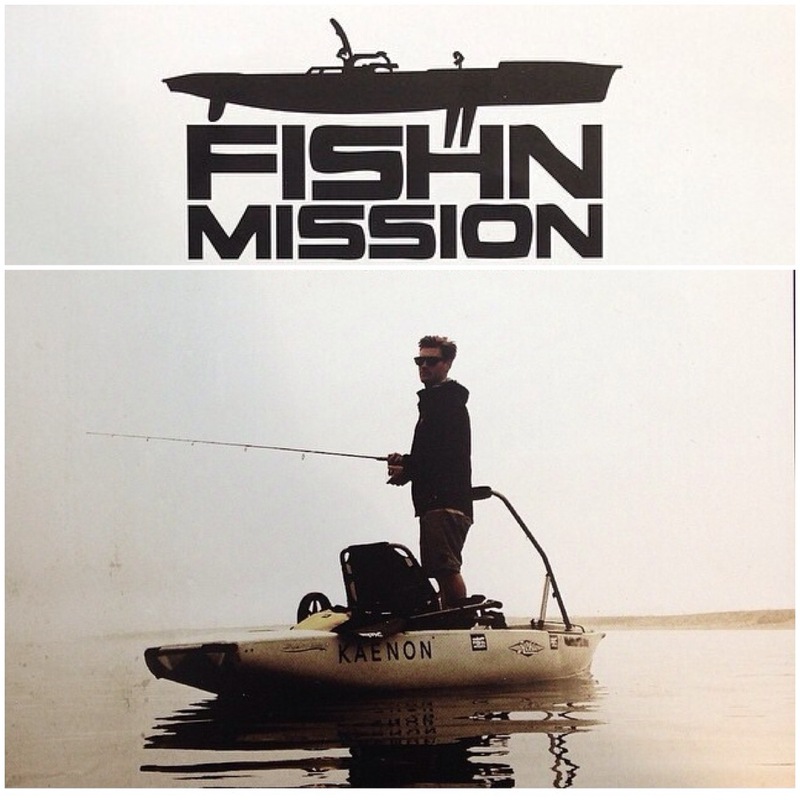 Hobie Surf :: A Shameless Blog Post All About How I Caught A Fish at Fishn Mission!! I. Caught. A. Fish. Oh YEAH!!! Read it again, I Caught A Fish!!! Woot Woot holla at yo fishermama!! One fish, two fish, red fish, MY fish!! YEW!!! And, not just any fish! I caught a dastardly, super smart, wily, shrewd Ocean Living fish! Oh, they have eluded me for two years of trying… they have nibbled and evaded my true hearts desire to pluck them from their salty home. They have snapped my line and stolen my bait. They have left me standing on the shore bellowing ‘Darn you, you slippery clever rascals! Why won’t you just let me catch you??!! !” Oh, but all that changed on Friday, for on Friday I went from fisher to catcher!! 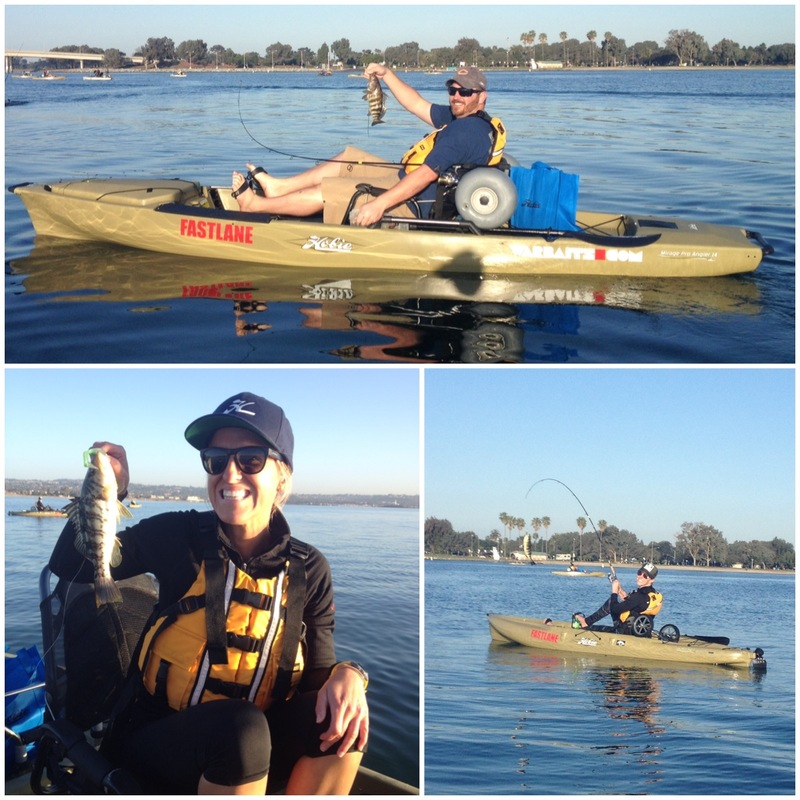 I sniped a calico straight out of his hidey hole in the eel grass and into my Hobie Mirage Pro Angler kayak…. Satisfaction!! Glorious sweet sweet fishy satisfaction! Ok, so how did I catch said fish, you ask?? I joined a group of people (ok I crowbarred my way into an invite) from all walks of Hobie life, and went on a ‘Fishn Mission’ put on by Fastlane Sailing Center in San Diego. A Fishn Mission is quite possibly the best and easiest way to get out into a personal boat and spend a morning doing a bit of angling! It is SET UP for you. Seriously. You park your car right in front of Fastlane’s waterfront location on Mission Bay. Walk like ten steps, turn a corner and your eyes get filled with your own little fish catching chariot in the form of a Hobie Mirage Pro Angler Kayak! It’s set with snack pack, pre lured poles, and ready to be wheeled the other ten feet to the water. Sweet living indeed!!! Before you put boat in water, Ron Lane, Fastlane’s Chief of All things Fishing/sailing, gives you a brief talk on how you operate the boat. Honestly, it’s pedal driven easiness with a basic rudder. SO SIMPLE, yet crazy effective and quiet. Then we got stoked out with inside fishing tips from Afran, creator/owner of Warbaits, on how to properly cast and reel for the area we would be fishing in. Then we were rolling our boats to the water and we were off! From parking lot to the water in under 15 minutes and another easy 5 minute pedal to the honey hole…. and you are on a Fishn Mission! That is precision and a team that knows what they are doing!! Just so you know, NO experience is necessary to have a GREAT time. Along on our crew were two people who had never been in boats, or used fishing poles. Everything is so well explained and well laid out that all 12 of us Hooked Up a fish at least once on the trip. Ron has a crew of expert fishermen along who check in with you through out the day, give you advice and help you land that elusive fish of your dreams. It was with Afran’s help that I finally got the right technique down to reel in my little calico friend! It was AWESOME!!! Plus, you get to yell ‘Hook Up’ when you catch one! Don’t freak out if you have never handled a hooked fish before, the guides are on it! They help you get your ‘I’m a hugely successful fisherman’ photo and show you how to de-hook safely so your little fish friend can go back to his watery home and tell stories of how he was ‘in the boat!!’. Oh, and there is a nice little sandy beach with restrooms where you take a snack break half way through the morning. Truly a set up for a great day if there ever was one!!! The Crew Representing Hobie by Hurley, Hobie Designs, Hobie Surf Shops, Hobie Fishing, Warbait, and our Hosts, Fastlane Sailing Center, During our Snack Break! After the day is on the water is over, you cruise back to Fastlane for a nice lunch. Then, since you are now a successful fisherman, you do what all great salty sea dogs do, you tell lies about how big the fish you caught was and how much bigger the one that got away was!! To go on your own Fishn Mission contact Fastlane (619.222.0766) and book your day!! 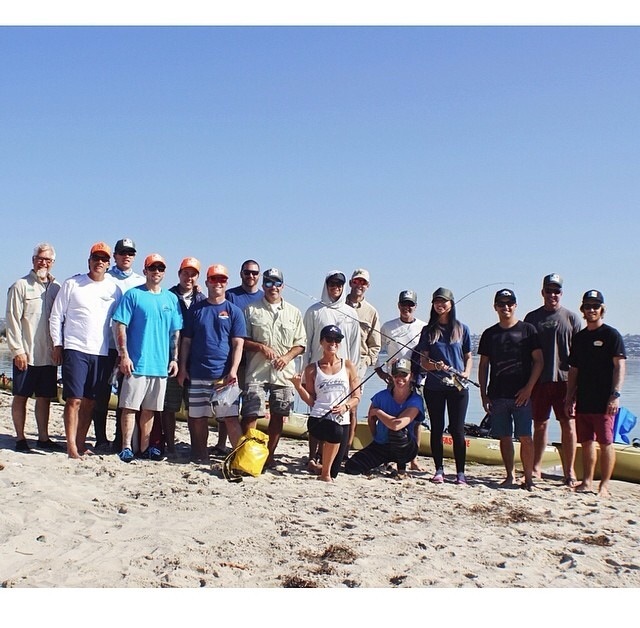 This entry was posted in General and tagged california, eel grass fishing tips, fishing, fishing mission bay, fishn mission, hobie, hobie mirage pro angler, Hobie Shop, Hobie surf, Hobie Surf Shop, how to catch a fish, kayak fishing in san diego, mirage drive, sailing, shop, surf, surf shop, surf shop blog, Surfing, surfshops, Tracey Engelking, warbaits in action. Bookmark the permalink. ← Hobie Shop :: MASSIVE WAREHOUSE SALE!!!!!!! Hi Joe! That board is for sale in our Dana Point Shop. 949-496-2366. it can be shipped, or we can make you a custom. The shop will have all the information you need.